8 The Willows, Allenwood, County Kildare. Kelly Hudson Properties present this 4 bed detached dormer to the market. This property has been maintained to the highest standard by its current owners and is in turn key condition. This beautiful family home comprises of kitchen/dining, utility, guest wc, sitting room, family/dining room , 4 bedrooms, 2 ensuite and family bathroom. This property also comes with a large garden and block built garage with ESB. Situated in Allenwood, this village has a very active community, with supermarket, and a national school. 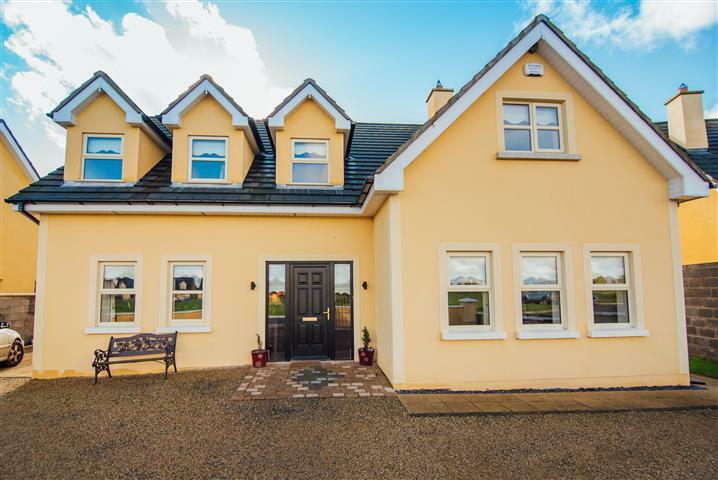 The busy town of Naas is less than 12 miles and access to the N4 and N7 is within easy reach. Viewing of this property is highly recommended. Hall: c.5.90m x c.2.75m Wooden floor, light fittings, telephone point, alarm point. Guest WC: c.1.75m x c.1.95m Tiled floor, WHB, WC. Sitting Room: c.4.49m x c.4.25m Coving, light fitting, feature marble fireplace with a stove insert and polished hearth, wooden floor, TV point. Bedroom 1: c.4.60m x c.4.22m Light fitting, blinds, TV point, telephone point. Bedroom 2: c.3.94m x c.4.17m Light fitting, vanity unit, carpet. Ensuite: c.2.80m x c.1.34m Tiled floor, tiled surround, WHB, WC, shower, shaving light & socket. Bathroom: c.2.99m x c.4.33m Tiled floor, tiled from floor to ceiling, free standing bath, separate shower, WHB, WC, heated towel rail, shaving light & socket. Kelly Hudson Properties present this 5 bed detached dormer to the market. This property has been maintained to the highest standard by its current owners and is in turn key condition. This beautiful family home comprises of kitchen/dining, utility, guest wc, sitting room, 5 bedrooms, 2 ensuite and family bathroom. This property also comes with a large garden and block built garage with ESB.